Perhaps I should have expected a bear-ful day yesterday (June 5), since I was going to spend the day on Bearbones Mountain. As I drove up Bearbones Mountain Road 2127 past Hills Creek Reservoir, a bear dashed across the clearcut into the woods. Seeing a bear once in a year is always exciting—last year I didn’t see any—but this makes 3 bear sightings this year, and it isn’t even summer (officially or weather-wise). A couple of more bends, another clearcut, and this time it was a lone elk. I’m glad they find something good about these hideous clearcuts. Unfortunately, there are a number of private parcels within the Willamette National Forest in this area, and they’ve been pounding them hard over the last few years, not leaving so much as a single tree standing. In fact, there’s a new one at the base of Bearbones just since my last trip there in 2008. When I reached the old lookout site on top of Bearbones, I noticed some bear damage along one side. As usual, they were after Lomatium hallii, evidently one of their favorite plants. The damage grew steadily worse as I headed down the wonderful side ridge. 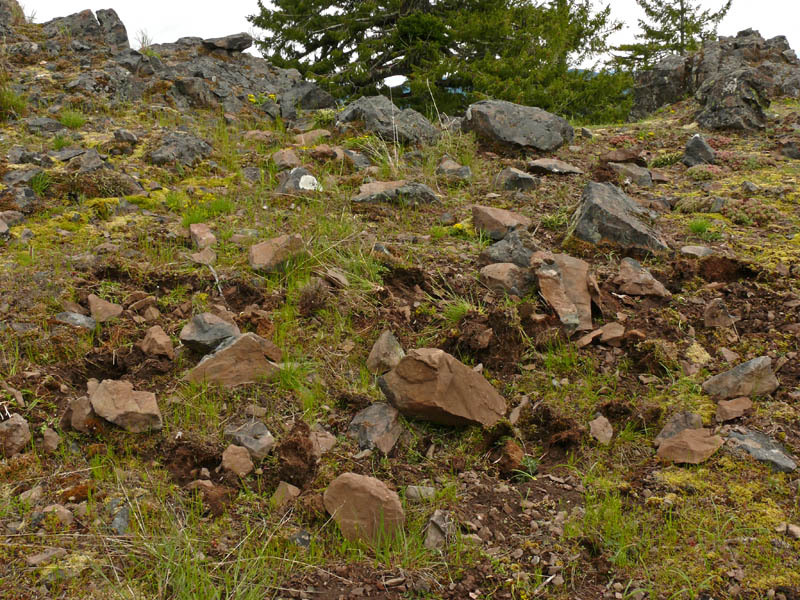 As I followed this bear hurricane along the ridge, I witnessed an increasing number of areas where the rocks were strewn about, and rootless tops of the Lomatium were lying about as evidence of their feeding frenzy. They were either very hungry or were following the poor advice of the olive flycatcher whose call I heard many times “Drink three beers, drink three beers.” For some strange reason—not being very good at putting things away myself—I felt compelled to try to clean up some of this mess. Putting the rocks back in the holes and replanting some of the collateral damage—mainly Selaginella but also ferns, onions, and small annuals—was the kind of impossible task a wicked witch might assign some poor fairy tale character. This is nothing new for this type of habitat, so I’m sure the plants can recover on their own. As for the undamaged plants, it is still early but looking very promising for a colorful display later this month. The glacier lilies were blooming beautifully on the north side of the summit, and there were lots of Viola sheltonii, Lomatium hallii (luckily the ripped up ones are only a small percentage of a large population), and Sanicula graveolens in bloom. Along the ridge were some of the pinkest Lewisia triphylla I’d ever seen. Everywhere there were the adorable fleshy rosettes of Claytonia rubra. I didn’t realize there was so much of it at Bearbones. The delphiums were quite pretty as well. 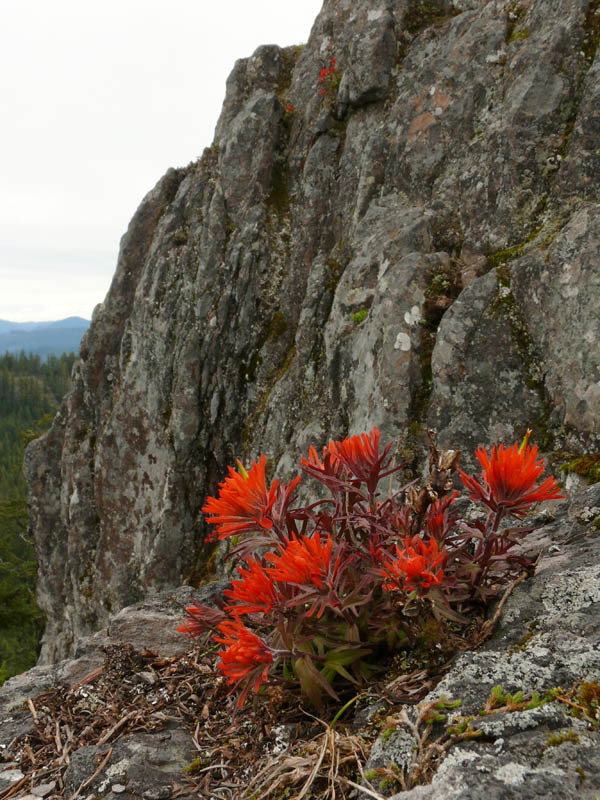 One of the fun things about descending the step-like plateaus of the side ridge is watching things in bud at the top gradually come in to bloom on lower levels. 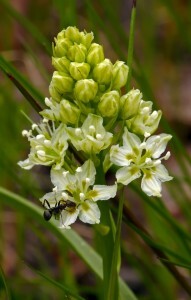 At the top of the ridge, the death camas buds were just emerging from the ground. By the time I got to the lowest (accessible) tier, many were in full bloom. 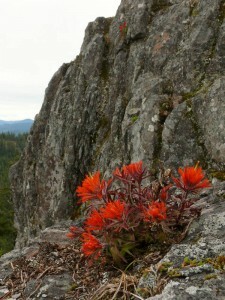 Near the southern end of its range, the gorgeous Castilleja rupicola was just starting to bloom. Another rare plant, Phacelia verna, was also just beginning as were the masses of onions (Allium crenulatum). Many of the large patches of Mahala mat (Ceanothus prostratus) were in bloom in varying colors from white to lavender. This is about the only place to find this plant in Lane County. The continued wet weather (it’s pouring as I write this) is beneficial for these shallow-soiled areas that often get their flowering seasons cut short by drying out quickly. Not a problem this spring!